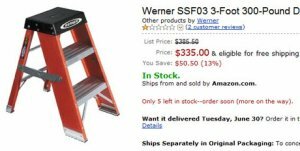 What is with the price on this Werner Ladder... Over $300 for a 3-foot ladder? At first I thought this was a mistake by Amazon, but when I did a search on Google for the same model number. I got some results that were not much cheaper ($262 - $286). Since it does not appear to be made of gold or silver, I can only assume that it is some type of limited collectors edition... or maybe like electronics, smaller means more expensive.